It has been a source of frustration not just for new Savage 10ML-II enthusiasts, but for all inline muzzleloading enthusiasts every year. 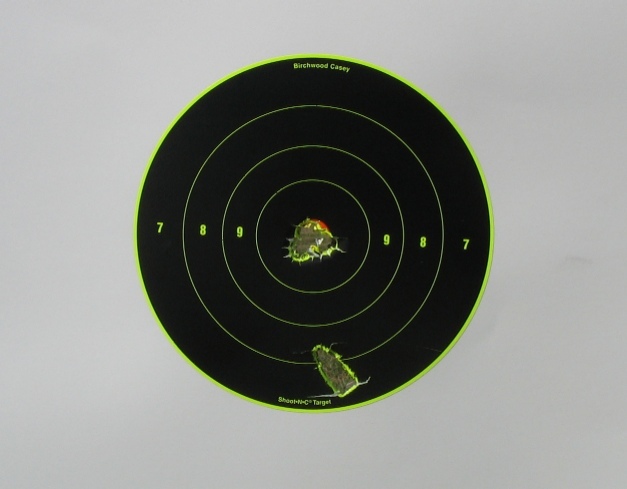 Whenever you get your new muzzleloader, often in the hottest months of the year, there is an overwhelming urge to run to the range and give it a go. I know the feeling intimately well. The owner's manual can wait, it can all wait, we want to go shooting. There is a secret of sorts to inline muzzleloading accuracy and it is “protect your sabot.” Current MMP sabots are far stronger than the original formulations with little question. As improved as they are, they are still polymer formulations that are affected by heat. It isn't unique to inline muzzleloaders, for a good way to get wide-open groups with a sabot-shooting slug gun is to just blaze away and get that barrel nice and hot. Accuracy can vanish with little delay. This year in northern Illinois, the weather has been uncommonly hot. It was the hottest June in recent memory, if not history, with temperatures normally reserved for the dog days of August. Global June temperatures in 2010 were the warmest on record as well. Hot barrels are the bane of sabots and inline muzzleloaders and this year has seen more of it than usual. I've done it myself countless times. The first two shots go through the same hole at 100 yards but on the third shot, what happened? Another potentially great group right down the drain. It typically is no gun problem, no bullet problem. It is a heat problem. If we can feel heat coming off of the barrel, the barrel is too hot. I'm often asked, “How Long Do You Wait?” There is no answer. If we want the best accuracy, we want a cold barrel. Whatever it takes to cool is based on the hotness of the barrel, not a finite amount of time. If we can feel heat on the outside of the barrel, it is far hotter deep on the inside of the barrel, precisely where we are going to place our saboted bullet. As soon as the sabot gets heat, it rapidly weakens and softens. Once our sabot integrity is compromised, we are just wasting our time. It doesn't take as many shots in a row as you might think. Two rapid shots out of a Savage 10ML-II can make our barrel unacceptably hot for the third shot. A picture may not always be worth a thousand words, but often it is worth more than a few. I'll show you what I'm referring to. Above, the first two shots out of a cold Savage 10ML-II stainless steel / laminate, Federal 209A primer, Barnes T-EZ 290 Flat Base bullet, MMP HPH-12 sabot, 44 grains Accurate 5744. 87 degrees F. ambient, no wind, high humidity. After two rapid-fire shots like that, you might be feeling pretty good. Not much can live on the difference. Actually, nothing can live on the difference. But after those two shots I had a hot barrel. Not waiting for the barrel to cool, it was crack off a third shot. The third shot was as beautiful of a keyholed bullet as can be hoped for. By not allowing the barrel to cool, I successful destroyed the ability of the sabot to do its job and the silhouette of the Barnes T-EZ 290 punching its way through the wood sideways is vivid testimony to my magnificent failure in not allowing the barrel to cool. With a cool barrel, a ratty one-hole group would have been the result. Ignoring barrel heat netted the fabulous keyhole. Some combinations are less prone to heat. As quickly as I could snap the photo and return to the bench, now with an even hotter barrel, I used the same load but this time subbing in an orange .458 / 50 MMP sabot and using a .458 diameter 300 grain Barnes Original Semi-Spitzer to compliment the .458 I.D. sabot. I can tell you from experience that the MMP orange sabot is more forgiving of temperature extremes, if only incrementally. Off goes the fourth shot. Above is the result. Now, had I been more attentive to barrel temperature, three shot ratty hole would have been the rule rather than the exception. For purposes of this article, I ignored barrel heat to be able to show you what it can do. 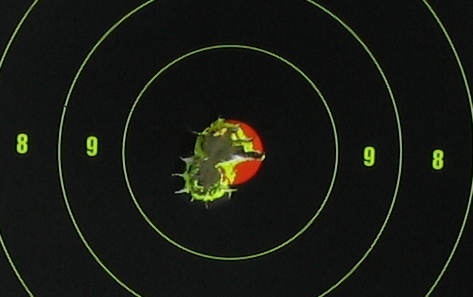 Continuing to shoot with a hot barrel will give you confusing and erratic results. This is not at all the case on a crisp, sixty degree fall day where you can essentially load and shoot, load and shoot until your powder and sabots are exhausted, or you are. This has nothing at all to do with a hunting situation where the motto is "One Shot, One Kill" and even in extremely warm temperatures (as we had in South Africa) two shots can be relied upon to give bughole accuracy. When it comes to hot weather shooting, though, considering quality over quantity will save you a lot of frustration and self-doubt. There are things we can do to mitigate the detrimental effects of barrel heating or required cooling time when we just have to target shoot in hot weather. The most enjoyable way for me is to just shoot something else for a while. Take a shot or two with your Savage 10ML-II, then put it in the shade for a bit. 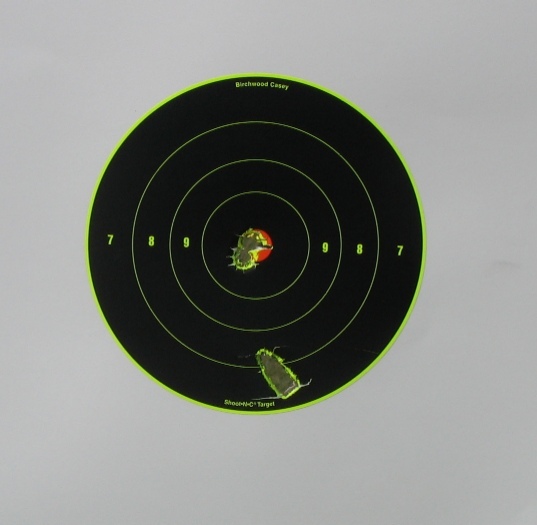 Plink away with a .22, your .223, or take a break while your buddy takes a couple of shots with his 10ML-II. Your barrel gets to cool, but you don't feel like you are baby-sitting it. Cooling rods also work. You can get a standard four foot section of 7/16 inch Dia. Round Bar 6061-T6 Aluminum and use it as a heat sink. Take a shot, insert your cooling rod, and it will draw heat out of your barrel and substantially reduce the cooling time necessary between shots. You can also reduce bullet weight and resultant pressure and heat by using the same load I was using (44 gr. Accurate 5744) and a 250 grain Barnes T-EZ Flat Base with the same HPH-12 MMP sabot for example, or reduce your powder charge by ten percent. Personally, the plinking, cooling rod, or letting your buddy shoot for a while makes the most sense to me. I'm a believer in doing range work with the identical components you intend to hunt with. Opting for quality of shots over quantity of shots in extremely hot weather is a good way to go. The crux of the biscuit is to completely avoid the unnecessary time and frustration caused by hot barrels. I've proven this to myself for years. Two shots out of a cold barrel go right where I want them, even on days in the upper nineties. The third shot is invariably off. Don't fall into the trap of thinking something is wrong with your load, your hold, or other things. Most of the time, it is simply a hot barrel. Some will load their muzzleloaders with hot barrels, then let them cool. Too late, the damage has already been done right after you loaded your rifle. Letting it cool after loading will not repair the integrity of a heat-compromised sabot, no matter how long you wait. The modern sabot is a wondrous thing. A sabot is nothing more than an improved version of the cotton patch, as in patch and ball. Properly selected, it allows us to load undersized projectiles firmly yet smoothly, takes up windage in the bore, and spins our projectiles to stabilize them. It also gives us the significant aerodynamic advantage of presenting a smaller than bore size profile to the wind, with flatter trajectory and higher strike velocity than you can get from a similarly weighted bore size projectile. It also gives us better sectional density for equivalent weight, translating to better penetration. Sabots also eliminate any lead, copper, or guilding-metal jacket fouling of our bores as our projectiles no longer have any direct contact with them. The sabot also acts as a wiper, expelling the majority of the previous shot's ash residue along with itself so we can load and shoot, load and shoot. The price we pay for all of these features and benefits is that we need to store them out of direct sunlight, as UV light can degrade them. We need to load them into cool barrels so they can do their job unfailingly with being compromised by heat. Do this and we have all of the benefits without frustration. That is one of the key elements to superb, consistent performance: we just need to protect sabot integrity.